I’d like a keyboard I can slot my iPad into and use it to control Nanostudio 2. Something like the now discontinued Akai SynthStation. I don’t need a plethora of features, just a small keyboard onto which I can mount the iPad or preferably slot it into, still use the touch screen and headphone jack (or get audio through the lightning port if NS2 supports that), and if possible provide line in ready for NS2 audio recording. A keyboard like this would turn NS into a full-featured standalone hardware DAW/sequencer/synth/... and would making composing with it even more of a joy. There's a 2 octave version of the ik multimedia io (I have the 49 key). 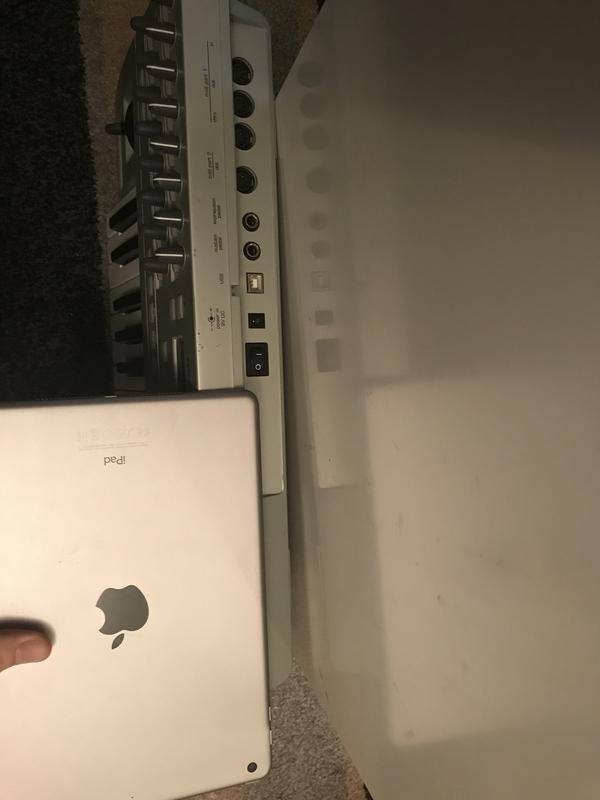 iPad doesn’t slot in, it comes with a small stand. If you use it the the new cck, it poses the iPad during use. Also has a built in audio interface. I haven’t tried it with NS2 yet, but it works with everything else. It’s waiting on my coffee table, taunting me, but I haven’t had time. Soon...still, should fit the bill for you. In my mind I’m visualising something like the Komplete Kontrol, but with a slot for the iPad instead of the screen. I have IK’s iKlip studio stand. It folds flat when it’s not in use and is super sturdy. 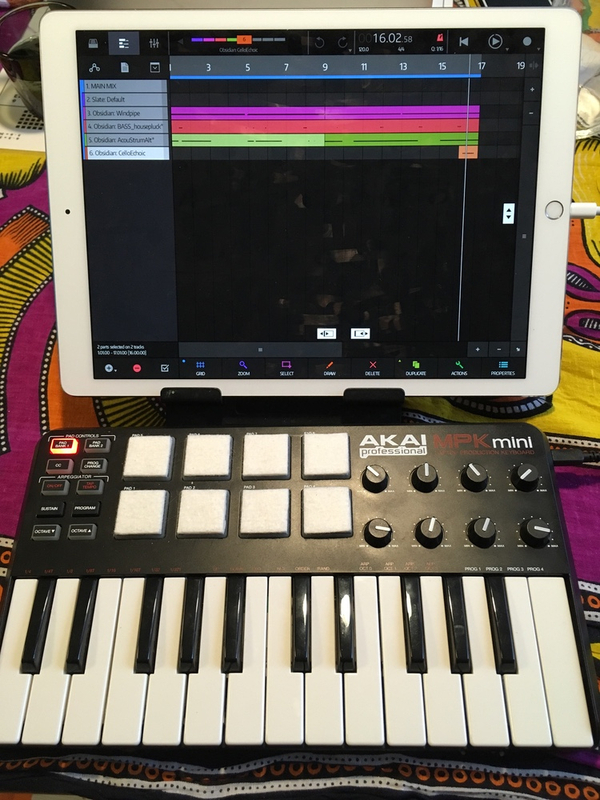 I use it with the MPK mini and it lifts the ipad just enough so they fit well together. It’s not a slot but it’s not far from it. Ohhhh I didn’t know you could get the clip separately from the keyboard. The IK Keys I/O is really nice, but massively overkill for NS as the keyboard itself also provides an audio interface. So getting just the clip and then a more basic controller would be a great compromise! I think there is a gap in the market for a keyboard with a iPad slot. Imagine using that in a live performance. Ahh wait, does that stand sit behind the keyboard or attach to it? I really want to be able to sit on a comfy chair with the keyboard on my lap and the iPad right there so I can just play and jam in my down time. Having the iPad physically separate from the keyboard would make this cumbersome. No worries, it's still an option in the interim while I look for something that will actually contain the iPad (or at least have it attached). consider buying Novation X-Station - there is enough free place at right side to glue there some dock and make DIY dock for ipad with keys, knobs and usb audio interface ! Well if we’re including glue as an option then I may as well use my Novation Remote 25 Hmm, could that actually work? The Remote has a socket for external power though I’ve never used it as it’s also USB powered. But if I got a power supply for it and a lightning to USB adapter, would the keyboard actually work in NS2? There is a lot of space on the right hand side of a Novation X-Station 49 key. I would get a square of kydex or abs plastic, heat it in the oven at 3OO F until it just starts to get a bit bendy, then curve 2 of the edges (ideally around a previously created wood piece that is the same exact dimensions as your iPad) to create a holder for the iPad to slot into. Then use heavy duty velcro to attach the plastic holder to the Novation X-Station and you are golden. Or silver. I like silver a lot. I reckon the Remote 25 might just work. It would overhang but if I can fix it firmly enough it would probably be fine.